The earliest known medical document known to man is what is known as the Edwin Smith Papyrus. Edwin Smith was an Egyptologist who bought fragments of the document in London in 1862. Although he understood its importance he never published on it and the papyrus became all but forgotten. In the 20th century this vastly important work was rediscovered. Dating back to 1600 BC it is our first known medical writing. Important to the history of breast cancer it also describes in writing the earliest known cases of the disease, one of which was a man. In ancient Egypt the history of breast cancer treatment begins with cauterization of tumors found in the breast with an instrument known as "the fire drill." Although medical practitioners are able to remove these tumors in some cases they are for the most part unable to stop the disease from taking its course. Writes the ancient Egyptian doctor of breast cancer: "There is no treatment." The Edwin Smith Papyrus is the only surviving copy of part of an Ancient Egyptian textbook on trauma surgery. 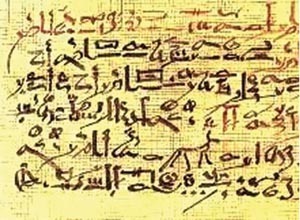 It is among the world's earliest surviving examples of medical literature, the Kahun Gynecological Papyrus being older, and is the world's oldest surgical document. Written in the hieratic script of the ancient Egyptian language around the 16th century BC, it is based on material from a thousand years earlier. This brief document, the entire translation of which can be seen online, consists of a list of 48 traumatic injury cases, each with a description of the physical examination, treatment, and prognosis. Like the Ebers Papyrus, the Edwin Smith Papyrus was purchased by Edwin Smith in 1862. Edwin Smith was an American living in Cairo, Egypt, and he has been described as a dealer of antiquities, an adventurer, and a money lender. 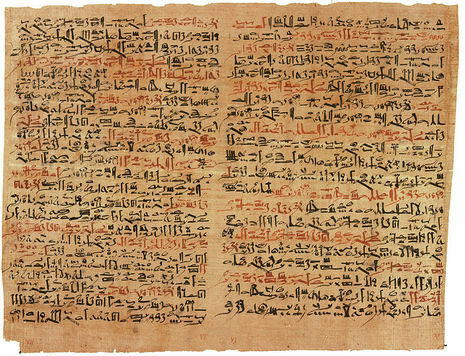 Smith bought the ancient manuscript from a dealer named Mustapha Aga in the city of Luxor, Egypt. First he bought an ancient manuscript where the roll was missing some of its outer portions and two months later was sold the remaining fragments glued onto a dummy roll. Smith placed the two parts together and recognized the importance of the manuscript. He also attempted to translate it, but never published it. He died in 1906, leaving the papyrus to his daughter who gave it to the New-York Historical Society. Early in 1862, during his residence in Thebes, Mr. Edwin Smith, a man of great intellectual gifts, purchased what is now known as the Edwin Smith Surgical papyrus.